Groucho glasses? Check! Now I have my costume ready! Bleh! Look into my eyes, 3.5 readers! You are getting sleepy. Very sleepy. You want to do my bidding. You want to be my obedient slave. You want to give me your Netflix password. Seriously, give me your Netflix password. Vampires like House of Cards too. Bleh! Why are you laughing? No wonder the Vampire League ousted me. I can’t even glamour the 3.5 devotees of a substandard book blog. 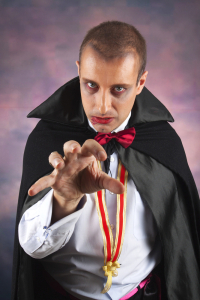 But rest assured, other vampires are better at the ancient art of vampire hypnosis, better known as “glamouring” and if you’re not careful, you will become a vampire’s puppet. Here are some tips to avoid being glamoured.